Yes the thermometer shows It’s Hot! 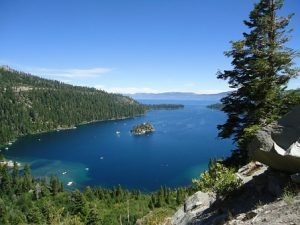 Fortunately, just about a 45 minute drive away Lake Tahoe is one of the best places to simply soak rays, congregate with outdoor lovers just like you and commune with nature. 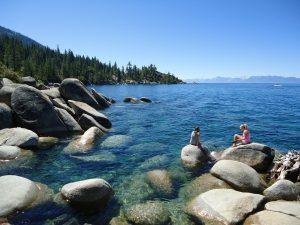 Lake Tahoe simply has some of the best beaches in the world and there’s a beach that’s just your style. Sand Harbor Just south of Incline Village on Hwy 28, Sand Harbor is regularly rated by locals and visitors alike as the most beautiful beach at Lake Tahoe. 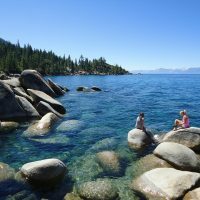 Pristine water and picturesque boulders make for memories and Sand Harbor is also the home of The Lake Tahoe Shakespeare Festival. Zephyr Cove Another huge family resort, boat tours, horseback rides and crowds. Thanks to Jordan Rane from an article on CNN Travel for his above top 6. 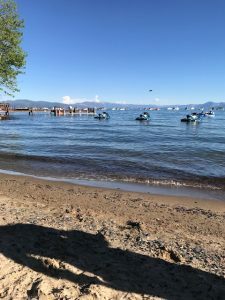 But really, is there a bad beach setting at Lake Tahoe? Speedboat Beach Just west of Stateline on the north shore is Speedboat Ave. Following the road to the end. There’s plenty of signs, parking and few crowds. Big boulders make this a great getaway. Moondune Beach On the north shore just west of Safeway in Kings Beach. A little schlepping from parking on Hwy 28, but a great spot. National Avenue Beach In Tahoe Vista at National Avenue. It’s getting more popular with paddleboat, jetski, and a boat ramp. Plenty of parking simply an easy beach to get to. Skunk Harbor One of the best spots on the Lake and popular to get to by boat. Going there by boat? Get there early. Parking is available on Hwy 28 and accessible by a mile long path down to the lake. Hurricane Bay Along the west shore on Hwy 89 just a few miles south of Sunnyside. Just pick a spot and chill. Planning on setting up your umbrella and turning off your phone for awhile? Don’t bring your dog! 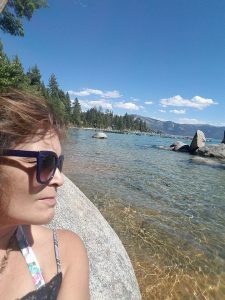 Yes, that’s exactly what I said, Lake Tahoe is not really dog friendly. If you bring your dog to almost all of the above mentioned beaches you could end up with a $250 fine and a Notice to Appear, yes you have to appear in front of the judge. This is a pricey problem and could cost you lost time at work for the court appearance. 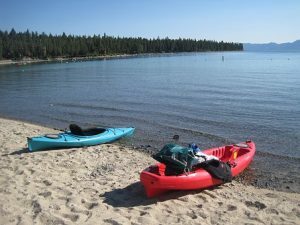 So use some resources available to find if Fido can frolic at Tahoe with you: www.dogtrekker.com, bringfido.com, or tahoedog.com.